But for everyone else in search of a quick dinner on a weeknight? This one’s for you. This recipe changes for us based on what kind of night it is. If you have some time, I advise slow-cooking the tomatoes for an hour and a half at 300°F. This results in blistered, concentrated tomatoes that fall apart beautifully when mixed into the pasta. If it’s a weeknight and you only have 30 minutes or so, proceed as directed. Preheat oven to 350°F. 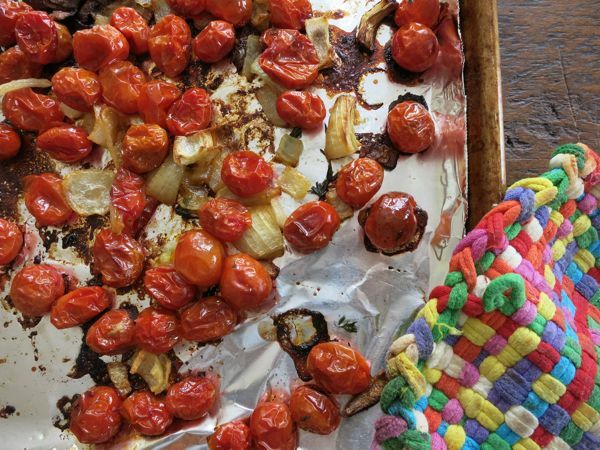 Dump tomatoes and onions on a baking sheet lined with foil. Add 2 tablespoons olive oil, salt, pepper, red pepper flakes, thyme leaves and toss with your fingers or a spoon. (Do this gently so you don’t rip the foil.) Bake for 25-30 minutes until tomatoes look shrivelly and brown but not burnt. Meanwhile, bring a large pot of water to boil. Add pasta and cook according to package instructions. When draining, reserve a ¼ cup of pasta water. Place pasta pot back on burner over low heat and add butter and remaining olive oil. Add penne back to the pot and toss with tomato-onion mixture and cheese. If it’s looking gloppy or sticky, add a little reserved pasta water to loosen. Serve with additional grated Parm. If you are feeling indulgent, a dollop of ricotta is gonna be pretty excellent. The post-roast. See how easy? We eat this once a week in the summer at my house, although I would eat it every night if I could get away with it. We top it with lots of fresh basil. Perfection. Yes! I can’t wait for Virginia tomatoes to come into season…this is even better when your tomatoes are picked right in your own backyard. I had the wisdom to slow roast a half bushel of plum tomatoes last summer when they were at their peak, and I’ve still got some left in the freezer. Definitely going to use them to make this tonight! This topped with ricotta, parm, and basil ribbons – nothing better! We make this all the time but we halve the tomatoes first and use goat cheese instead of Parmesan. Never thought about roasting onions too. Will have to try it! 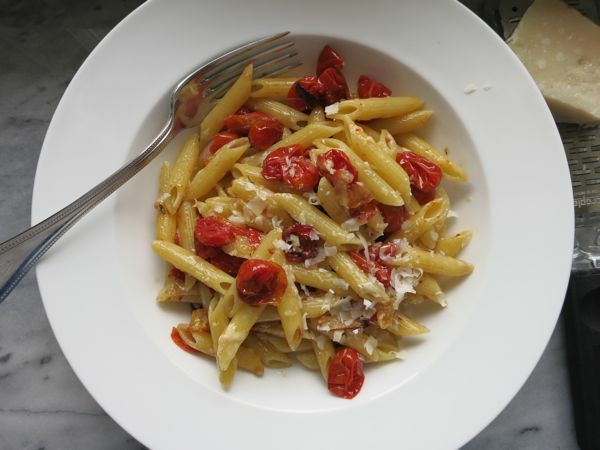 Spread some parmesan and bread crumbs over the tomatoes before roasting too – so good! I’ve been making something very similar to this at least once each week since the last month. Cherry tomatoes have been on sale here and I love the sweet tartness that comes with roasting them. A definite comforting crowd pleaser! We like this with cut up brie cheese tossed in so it just starts to melt but stays together. Loving that potholder! My supply is all worn out. Stock up while your kids are young! I’m all about easy, quick meals and this looks like the easiest of them all! Plus, it combines tomatoes and pasta…my favs. Can’t wait to give it a try! I love easy meals like this! It looks delicious too. 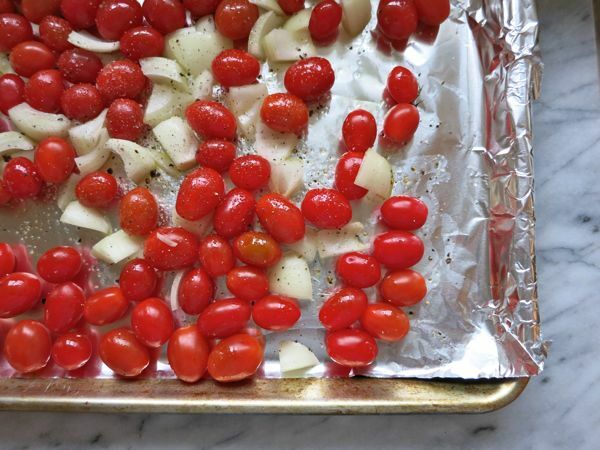 We’ve been oven roasting cherry tomatoes a lot lately too. I can’t seem to get enough of them. Great as a snack or with appetizers. Try halving them before roasting for a different texture. Made this tonight and it was wonderful! Thank you! This is almost a pantry meal for me because I almost always have everything needed on hand. You have impeccable timing. I have just been given 8 hours notice that I need to make an entree for an Italian themed dinner for the teachers at my sons preschool. This is what I’m making – you rock! I have a great recipe that involves doing exactly this (but adding balsamic vinegar to the baking sheet), then taking it another step by pureeing the whole mess after it’s roasted. Then I like to add some chicken sausage and manchego cheese to the dish at the end. Or I bet pancetta or plain old bacon would be nice too. Made last night with my tired tomatoes and a red pepper that had seen better days. Soooo yummy. Thanks for the inspiration! I make something very similar but I use a mix of all kinds of tomatoes, varying in size, taste and color. I also add fresh basil just before serving. This looks delicious. I normally keep homemade spaghetti sauce in the freezer but this would be great, especially when we run out of frozen sauce! Slow-roasting the tomatoes is a great idea… and a perfect reason to have a late dinner by candlelight on a weekday! I made this last night and added some fresh arugula from my CSA when I tossed the pasta. Yum! Thanks for the wonderful dinner (and lunch today). I love the idea but the rest of my family eaters won’t or can’t eat tomatoes…sigh. This was so yummy and easy! I think that little bit of butter at the end made the dish something special!